Made by Unknown (person), 1900-1920. This a timber and iron framed bicycle has two timber wheels of equal size, with radial wooden spokes and iron tyres. Although steering from the front wheel is achievable, there are no pedals or brakes. There is a padded leather seat and a padded leather rest for the abdomen and elbows, which provided greater purchase when pushing off the ground with the feet. This type of bicycle was invented in 1817 by Charles Baron von Drais de Sauerbrun of Mannheim in Germany. It operates by 'leg power' only - the rider sits on it and runs, and it has no pedals and no brakes. 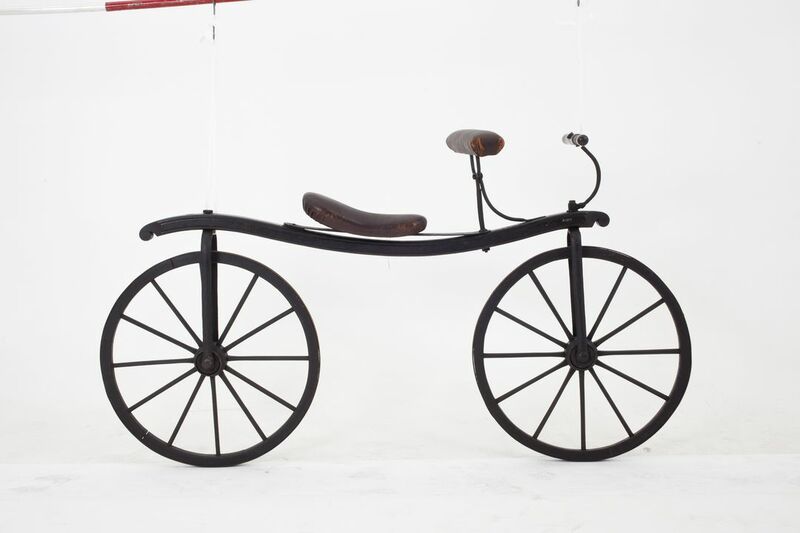 This reproduction Draisine was probably made early in the twentieth century. The bicycle was purchased by the Museum in 1954. It was one of nine bicycles and tricycles from the collection of Richard G. J. Nash of Weybridge, Surrey, England. Richard Grainger Jeune Nash (1910-1966) was born in Ireland but grew up in Weybridge, Surrey. During the 1920s he became an automobile engineer at the famous Brooklands racetrack nearby. Brooklands was the world's first purpose-built motor racing circuit and opened in 1907. It was also the venue for early bicycle racing and soon attracted pioneering aviation manufacturing companies as well. In 1932 Nash established a hill climb record in his Frazer Nash, "The Terror", up the Brooklands test hill. During the 1930s he was actively building up a collection of old aircraft, automobiles and bicycles which was known as the International Horseless Carriage Corporation. In 1939 motor racing ceased at Brooklands and during the Second World War the site was taken over for military aircraft production. In 1952 Nash offered to sell his entire collection of some 23 veteran cars, 46 pre-1900 bicycles and seven pre-1918 aircraft to the Museum. At that time his address was noted as The Beeches, Hangar Hill, Weybridge, Surrey. Nash had family members in Australia and apparently felt his collection would be of value to show the history of technology in the colonies. Because of the prohibitive transport costs from England to Australia, the Museum was only in a position to purchase 9 bicycles from the Nash collection. The Museum's Director, Mr A.R. Penfold, inspected the bicycles in a hangar/store at Brooklands while visiting England in 1953. The bicycles were subsequently shipped to Australia on board the "SS Orion". Unfortunately, the bicycles came with no provenance. Much of the remainder of the Nash collection appears to have been dispersed to museums throughout Britain. After the War civilian aviation continued at Brooklands with several Concordes later built on the site. After the British Aerospace factory closed in 1986 the Brooklands Museum Trust was formed and a museum of the site opened in 1991.